When you look at your mammogram report, you may see a number between 1 and 5 that is called the "BIRAD score." This number is meant to let your doctor know on a scale of 1 to 5 the likelihood that what is seen on your mammogram is cancer. If your number is 1, you can probably feel at ease, while if it is 5, you will need further testing. What does it mean, exactly, if your number is in the middle of this range? Why was the BIRAD system developed, what do the different categories mean, and what are the limitations of the classification? With the large number of mammograms done across the country, radiologists hoped to find a way to standardize and compare mammograms. Since mammograms are done at a number of different facilities and read by different radiologists, all of who may use different descriptions and terminologies, making comparisons could be challenging at the least. In order to study the correlation between mammogram findings and the risk of breast cancer, we needed a way to compare mammogram images done on a large number of women. The Breast Imaging Reporting and Data System (BIRADS) is an answer to this lack of consistent and comparable data. Your mammogram report includes many technical details including any findings and a description of any abnormalities. One section on your report will show you a Breast Imaging Reporting and Data System (BIRADS) score. Your BIRADS score is a number between one and six which indicates the radiologist's opinion as to the absence or presence of breast cancer. We will discuss what the different numbers mean below, but it's important to discuss your results with your doctor as well. Breast findings can't always be categorized into one of six categories and it's important to hear what she is thinking about you specifically, rather than just hearing a number. Your score will, however, give you an idea as to your diagnosis and potential treatment options. BIRADS was developed by the American College of Radiologists as a standard of comparison for rating mammograms and breast ultrasound images. It sets up a classification for Level of Suspicion (LOS)—the possibility of breast cancer. After your mammogram or breast ultrasound, a radiologist will read the image and write a report, giving an opinion on your breast health. Many people think of mammograms as being "yes-no" types of reports. That is not the case as can be seen on the classification below, and there are many in between or gray areas that are found on mammograms and ultrasounds. In being your own advocate in your health care it is important that you both receive a copy of your results, and discuss exactly what your mammogram describes with your doctor and/or radiologist. If you've had a mammogram and were given your BIRAD score you may be anxiously wondering what it means. Let's look at the six different categories, and what each of them may mean to you based on studies looking at a large number of women. You BIRAD score will give you a number between 0 and 6 in which findings on your mammogram are described, but what does that mean for you personally? A score of 0: A score of 0 does not mean that there are no findings of concern. Instead, this means that your ultrasound or mammogram cannot be read without further clarification or imaging tests. Scores of 1 to 2: Scores of 1 or 2 basically "look okay" and describe reports in which either nothing abnormal is seen, or that any abnormalities seen by the radiologist appear to be benign breast conditions. This does not mean that you are not at risk for breast cancer or could not have breast cancer. It's important to note that breast cancer can be present with a completely normal mammogram, and this happens not infrequently. If your mammogram score is in this category, it is still important to have a clinical breast exam at a frequency determined by you and your physician. It is also important to follow up any abnormalities you have noted yourself on self-breast exams. Other tests, such as a breast MRI or a breast biopsy may be needed even if your BIRAD score is 1 or 2 if you have any symptoms or concerns (such as a genetic predisposition to breast cancer). Scores of 3 to 5: A score over 3 means that you will require some type of follow-up. This may include further views, a breast ultrasound, a breast MRI, a form of breast biopsy, or a combination of these tests or others. A score of 6: A score of 6 is given only after a biopsy has been examined and found to be cancerous. In this case, treatment would definitely be required. Your mammogram or ultrasound didn't give the radiologist enough information to make a clear diagnosis. This does not mean your doctor is necessarily worried about breast cancer. It could be that your exam shows scar tissue from a previous biopsy or surgery or that a breast lump that is big enough to be easily felt isn't imaging clearly. You will need to have a follow-up image done. There are no suspicious masses or calcifications to report and your tissue looks healthy. Breasts are same size and shape and tissue looks normal. Any cysts, fibroadenomas, or other masses appear benign. There are no suspicious lesions, masses, or calcifications to report, but follow-up to confirm that no cancer exists is recommended. This may be needed if your radiologist does not have your baseline or a previous mammogram for comparison. Category 3 is the most difficult BIRADS score when it comes to planning subsequent evaluation, whether further studies or careful monitoring. There are some suspicious lesions, masses, or calcifications to report and a breast biopsy is recommended to check the suspicious area. There are masses with an appearance of cancer. A biopsy is recommended to make an accurate diagnosis. It's important to note that even though this category is "malignant" there are masses which can appear like cancer but which are related to a benign process instead. 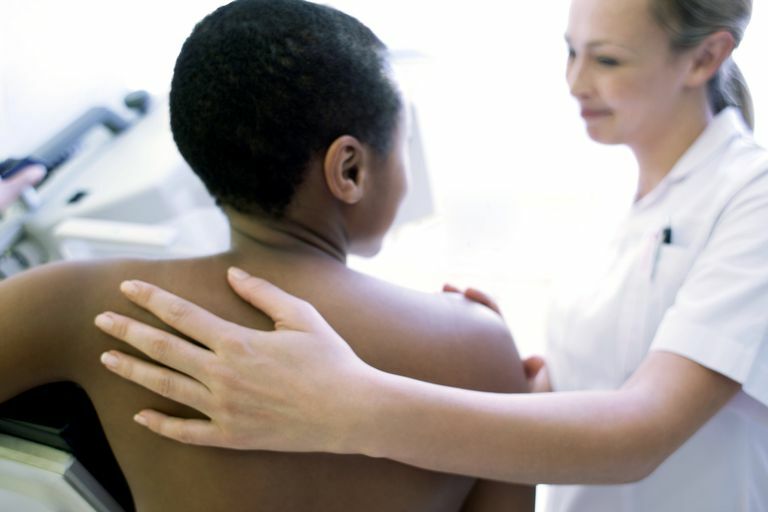 Conditions such as adenosis, fat necrosis, radial scars, mastitis, and more can sometimes mimic cancer on a mammogram. Category 6: Malignant Tissue: Category 6 is only used if tissue from a biopsy has been examined and found to be cancerous. If this is the case, treatments such as surgery, chemotherapy, and/or radiation are required. It's again important to note that your BIRADS score doesn't replace your physician or radiologists thoughts with regard to your mammogram, ultrasound, other tests, or findings on clinical exam. Some findings will not fit neatly into the above categories, and even within categories, there may be a wide variety of findings. For younger women, especially children, and adolescents, the BIRADS score may not be as reliable. Dense breasts can also reduce the sensitivity of mammography in looking for breast cancer. It's also important to stress that imaging studies alone are not enough to diagnose breast cancer. While they may be fairly accurate at times, there are ​benign breast conditions that mimic breast cancer not only on the exam, but on mammograms, ultrasound, MRI, and even PET scans. Your BIRADS score on your mammogram and/or ultrasound is broken down into six categories based on the likelihood of any findings to be breast cancer. This score can be helpful in predicting your diagnosis and treatment, but should always be used along with a discussion with your physician and/or radiologist. It's also important to note that findings on a mammogram or ultrasound alone cannot determine whether a cancer is present. Cancers are sometimes missed on the mammogram, and conversely, some findings that look like cancer may turn out to be benign. Further testing, whether with an ultrasound, breast MRI, or breast biopsy may be needed no matter what your score is based on your symptoms and family history. Koning, J., Davenport, K., Poole, P., Kruk, P., and J. Grabowski. Breast Imaging-Reporting and Data System (BIRADS) Classification in 51 Excised Palpable Pediatric Breast Masses. Journal of the American College of Surgeons. 2014. 219(3):S78-S79. Rao, A., Feneis, J., Lalonde, C., and H. Ojeda-Fournier. A Pictorial Review of Changes in the BI-RADS Fifth Edition. RadioGraphics. 2016. 36(3):623-639.